Below you fill find all funeral homes and cemeteries in or near Corvallis. Suburbs of Corvallis: Adair Village, Oregon State Univ. Corvallis is also known as: Benton County / Corvallis city. Their current mayor is Mayor Biff Traber. Zip codes in the city: 97330, 97331, 97333, 97339. Some of the notable people born here have been: Carl Wieman (physicist and professor), L. J. Shelton (american football player), Brad Badger (american football player), Mike Zandofsky (american football player), Reni Lane (singer and musician), Jay Locey (coach), and Deane Ogden (drummer and conductor). Corvallis is home to the following sports teams: Oregon State Beavers men's basketball. Corvallis /kɔrˈvælɨs/ is a city in central western Oregon, United States. It is the county seat of Benton County and the principal city of the Corvallis, Oregon Metropolitan Statistical Area, which encompasses all of Benton County. As of the 2010 United States Census, the population was 54,462. Its population was estimated by the Portland Research Center to be 55,298 in 2013. Corvallis is the location of Oregon State University and a large Hewlett-Packard research campus.At a longitude of 123 degrees west and 17 minutes, the city is the westernmost city in the lower 48 states with a population larger than 50,000. It was noted by Register Guard on March 10th, 2019 that John Dalrymple III Atkinson died in Corvallis, Oregon. Atkinson was 78 years old and was born in San Francisco, CA. Send flowers to express your sympathy and honor John Dalrymple III's life. It was written by Register Guard on March 10th, 2019 that James Roland Millican passed away in Corvallis, Oregon. Millican was 63 years old and was born in Bakersfield, CA. Send flowers to share your condolences and honor James Roland's life. It was written by Register Guard on February 12th, 2019 that Thomas Reidar Jr Aasum died in Corvallis, Oregon. Aasum was 90 years old and was born in Saint Paul, MN. Send flowers to share your condolences and honor Thomas Reidar Jr's life. It was written on February 3rd, 2019 that William L "Bill" Taggart passed away in Corvallis, Oregon. Taggart was 82 years old and was born in Newark, OH. Send flowers to express your sympathy and honor William L "Bill"'s life. It was reported by The Herald on December 2nd, 2018 that Frederick John "Rick" Campbell passed away in Washington. Campbell was 74 years old and was born in Corvallis, OR. Send flowers to express your sympathy and honor Frederick John "Rick"'s life. It was written on November 8th, 2018 that Elsie L Dickey (Larnell) perished in Corvallis, Oregon. Ms. Dickey was 90 years old and was born in Kenmare, ND. Send flowers to express your sympathy and honor Elsie L's life. It was noted by Register Guard on October 23rd, 2018 that Carolyn Jean "Peggy" Haney (Davis) died in Corvallis, Oregon. Ms. Haney was 80 years old. Send flowers to express your sympathy and honor Carolyn Jean "Peggy"'s life. It was noted by Register Guard on September 25th, 2018 that Joyce Caroline Schuman (Bromley) passed on in Corvallis, Oregon. Ms. Schuman was 89 years old and was born in Virgil, SD. Send flowers to share your condolences and honor Joyce Caroline's life. It was disclosed by Register Guard on September 2nd, 2018 that Geraldine Gaye "Gerry" Prodfit-Demoss (Prodfit) passed on in Corvallis, Oregon. Ms. Prodfit-Demoss was 85 years old. Send flowers to share your condolences and honor Geraldine Gaye "Gerry"'s life. It was revealed by Register Guard on August 30th, 2018 that Geraldine Gaye "Gerry" Proudfit-Demoss (Proudfit) passed away in Corvallis, Oregon. Ms. Proudfit-Demoss was 85 years old. Send flowers to express your sorrow and honor Geraldine Gaye "Gerry"'s life. 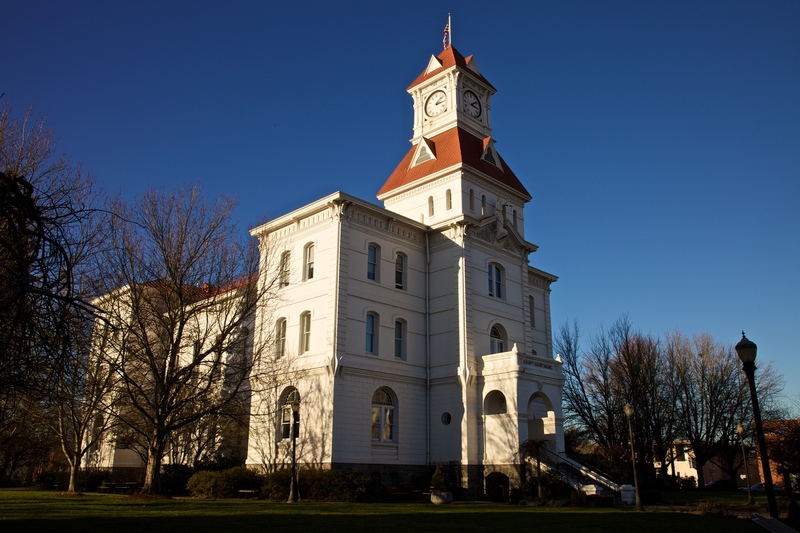 The town served briefly as the Oregon State Capitol of the Oregon Territory in 1855 before Salem, Oregon was eventually selected as the permanent seat of state government. In 1853, the Oregon Territorial Legislature assembly changed the city's name to Corvallis, from the Latin phrase 'cor vallis', meaning "heart of the valley." Corvallis was incorporated as a city on January 29, 1857. It is possible that the city was named after early settler Mary Lloyd, but now the name is thought to be derived from French fur trappers' naming of a Marys Peak peak after the Mary (mother of Jesus) Mary. Corvallis is a city located in central western Oregon, United States. The population was estimated at 54,880 as of 2008 by the Portland Research Center at Portland State University, however, and the City of Corvallis official website states the city has a population of 54,890 as of July 8, 2008. The official website for the city of Corvallis is https://www.corvallisoregon.gov/. Smith is also survived by his other children, Sandy Casteel of Albany, Sharon Kness of Coos Bay and Brad Smith of Vancouver, Wash. His funeral will be at 3 p.m. Saturday at Kingdom Hall, the Jehovahs Witness church in Corvallis. We work with local florists and flower shops to offer same day delivery. You will find budget sympathy flowers in Corvallis here. Our funeral flowers are cheap in price but not in value.